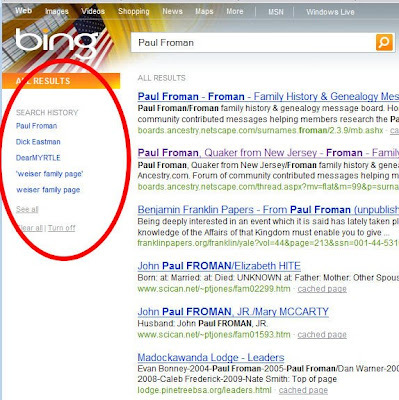 In Ol’ Myrt’s opinion Bing isn't as good with results yet when compared to Google, and of COURSE Bing doesn't include GoogleBook results in the search. Those Google Book results are important in my personal family history research and probably are in yours if you have US ancestral research. See my test search comparisons below, which are by NO MEANS scientific, just my initial comparison. Below my search results are the THREE THINGS I LIKE about BING. 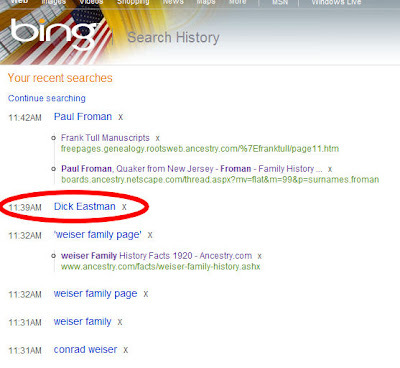 Search for: Paul Froman - 10-10 hits, including all the usual RootsWeb and Ancestry message board postings. If you wish to expand that list of searches, it shows the places you’ve gone as a result of that search. This would be terribly useful if you searched and wish to back down a previous search path for additional study. When your mouse rolls over the right portion of a hit list entry, up pops some text from the site in question as a preview to help you decide if you'd like to visit the site. So far, BING has got to get better on their search results for me to be switching from Google.